Initiate a capture from the capture window, which contains three tabs: Image, Video, and All-in-One. The tabs allow you to pick particular capture settings and make things happen even faster. All-in-One is a flexible option, but if you know the type of capture you want, you can always choose the Image or Video tab. To start your capture, click the red Capture button. Use the crosshairs to select what you want to capture. Hover over windows or regions to auto-select the area, or click and drag across a region to make a custom selection. Release the crosshairs to preview your selection. If needed, use the handles at the edges to make adjustments. 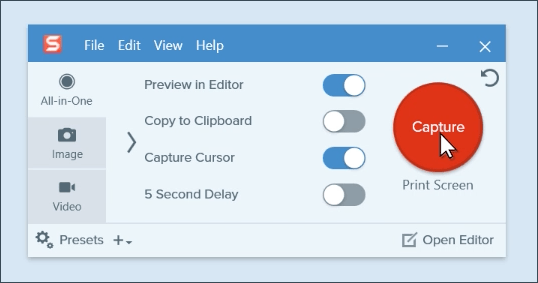 The Capture Toolbar is where you choose whether to launch an image, video, or panoramic capture. 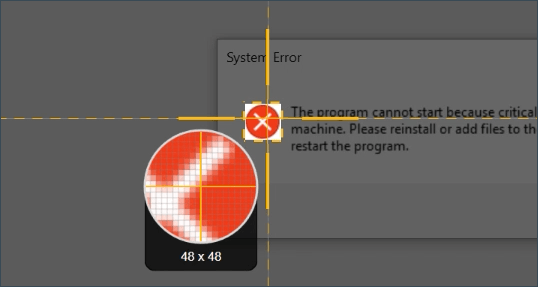 Click the camera icon to choose image capture. Captures are automatically brought into the editor where you can add arrows, callouts, make adjustments, and much more. When an image or video is ready to be saved or shared, open the Share menu and choose from one of the many destinations. The File option allows you to save your work right to your computer or a network drive.